HOLIDAY RECIPES TO WARM THE SOUL — Bucks County Coffee Co.
With the weather cooling off, a lot of folks are beginning to dispense with some of their iced coffee recipes in exchange for something that can warm them up on cool, rainy autumn evenings. If you’re looking for some delicious coffee-based drinks without having to break the bank at a high-end café, don’t sweat it. 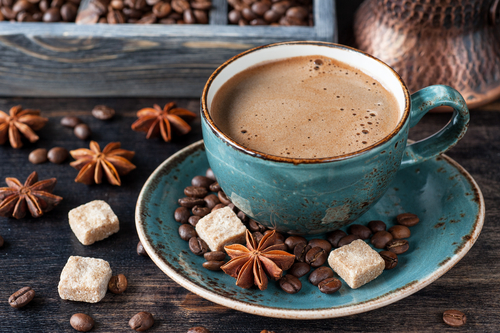 There are tons of incredible coffee beverages that you can make at home without sacrificing an ounce of quality or style. Courtesy of our team here at BUCKS COUNTY COFFEE CO., here are some of the drinks we recommend that you try this fall. For the first step, place the first 3 ingredients into a coffee filter, or the filter basket of a coffee maker. Add the 5 cups of water, and brew a cup of coffee just as you normally would. Next, combine the sugar, syrup, and milk in a large saucepan, and cook all of it over low heat until the sugar dissolves. When finished, pour the mixture into your coffee and then add the vanilla, topping off the whole thing with whipped cream. Cheers! First, combine the milk, sugar, spice, cinnamon, and vanilla in a saucepan, and cook on low heat until the sugar has dissolved just like the previous recipe. Once the sugar has dissolved, whisk the mixture vigorously until frothy. Afterwards, brew your cup of coffee and combine with the mixture. Top with whipped cream and enjoy! To order some delicious BUCKS COUNTY COFFEE, browse the shop right here on our website. And don’t forget — use the promo code FALL to save 15% on Pumpkin Spice Coffee!